The Colony KL by Infinitum is a freehold mixed development comprising of 723 units of 1 and 2 bedroom Dual-Key SOHO apartments, conveniently located beside Quill City Mall & Medan Tuanku Monorail Station, near KLCC. 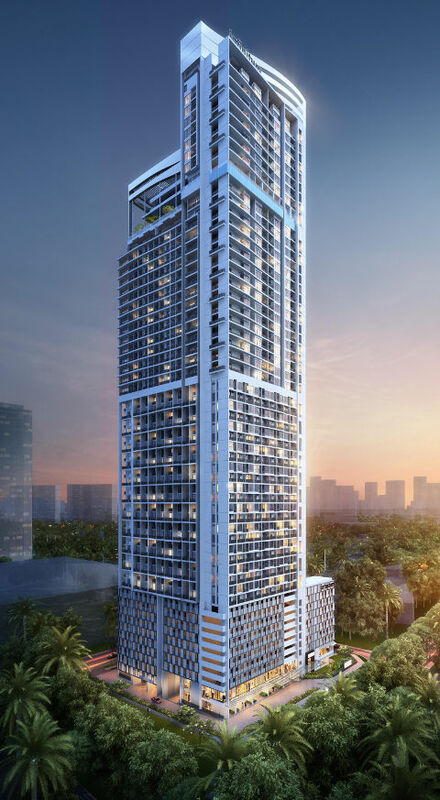 It offers ideal working and living experience at an attractive location with excellent conveniences and accessibility right in the heart of the capital city of Malaysia. A 2016 Kuala Lumpur new condo launch by reputable Singapore developers, Pacific-Roxy and Macly Group, at attractive price and affordable low cash down payment. Unit Type: Exclusive One and Two Bedroom Dual Keys Apartments, Duplex and Lofts. Latest update: Tower A selling out fast. Tower B launching soon this October 2016. Register now for your VIP Pass to Exclusive VIP Preview Price and Property Talk. Own a Unit from just SGD15k Down Only. Star-Buy Discounts Ending Soon. Don't miss this Affordable City Center KL Property Launch! SECURE YOUR CHOICE UNIT TODAY! Check for Available Units Now! Located in the City Centre of Kuala Lumpur just 1.4km from the iconic KLCC Petronas Twin Tower, The Colony KL by Infinitum is in an area that is popularly known as the Golden Triangle of Kuala Lumpur by tourists as there are many luxury hotels and tourist hot spots. It is also the international commercial and financial centre, shopping, recreation and entertainment hub, and cultural centre of the capital city of Malaysia, therefore irrefutably a prime property hotspot. Excellent Amenities Right Next Door. Beside The Colony KL by Infinitum is a newly completed mega mall, Quill City Mall (as big as Suntec City Mall). 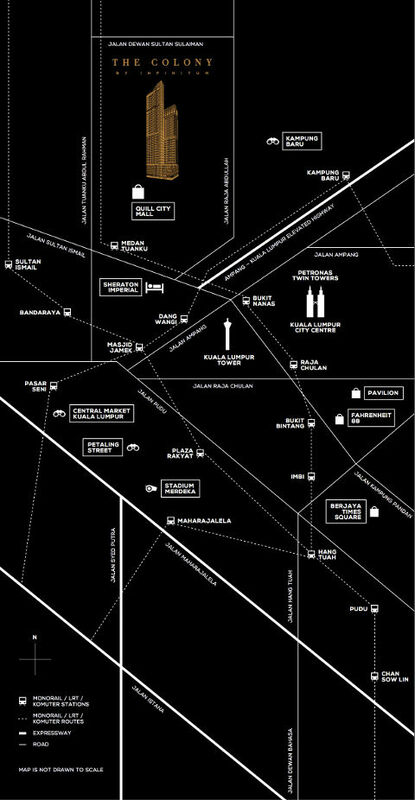 With over 320 lifestyle shops spread over 8 storeys, and with anchor tenants such as AEON departmental store and supermarket, and Golden Screen Cinema plus an impressive lineup of major international labels like Apple concept store, H&M and Adidas along with a great mix of both local stores as well as a wide selection of restaurants, residents of The Colony KL will enjoy the amazing conveniences available right next door. Excellent Accessibility just 5 minutes walk away. The Medan Tuanku monorail station which is at the doorstep of Quill City Mall is just 5 mins walk from The Colony KL by Infinitum, hence getting in and around the Golden Triangle is breeze. KLCC and Bukit Bintang are just 3 Stops away via the RapidKL which also seamlessly connects to KLIA Express at KL Sentral Interchange Station to the Kuala Lumpur International Airport, and soon to Greater KL via the upcoming MRT Line 1 which will start operation by end of 2016. By 2026 the train network will seemlessly connect to Kuala Lumpur-Singapore High Speed Rail making it convenient to travel to Singapore or vice versa in 90 minutes which will be a game-changer for professional lifestyles. Let us help you own your dream home. Just enter your information the form below and we'll get back to you within 24 hours. Designed with professional lifestyles in mind, The ColonyKL by Infinitum offers the ideal working and living experience. It is an impeccable match for professional who frequent Kuala Lumpur for work or those based in the city. A freehold mixed development, The Colony KL by Infinitum, comprising of 723 residential units, sits atop of three levels of commercial 31 retail shops and holds all the conveniences at doorstep. Each unit at The Colony by Infinitum is Dual-Key, with choices of 1 Bedroom or 2 Bedroom apartments, also available in Duplex and Loft configuration. As a SOHO unit - An excellent launch pad for your Kuala Lumpur businesses while having a different space for your personal life and prefect when you need to conduct your business 24/7. 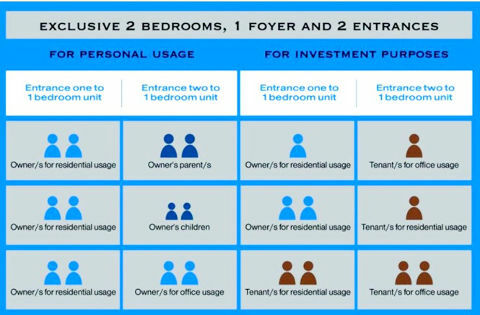 For Own use + Rental Income - Use one half of the unit for your own stay while earning rental income with the other half. Double your rental income by renting each half separately. A comprehensive range of facilities for a balance lifestyle are integrated at the roof top of The Colony by Infinitum. 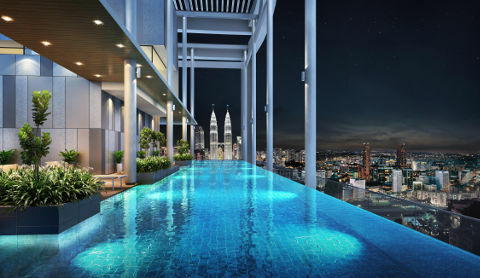 Infinity Swimming Pool - Unwind with a few laps at the pool against breathtaking views of the city skyline. The Children Playground - provides fun and laughter for the kids to run around. 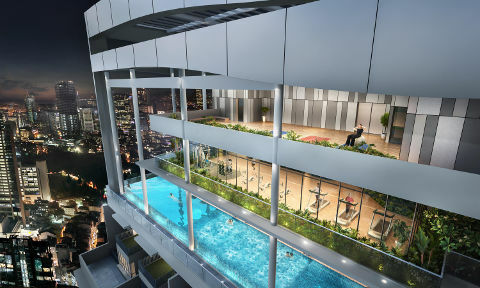 Developed by reputable Singapore developers, Roxy-Pacific Holdings and Macly Group, with financing supported by Singapore Banks and leading Malaysian banks, The Colony KL by Infinitum is in good hands, hence investors can invest with peace of mind. The Peak at Cambodia From US$ 1xxK ONLY! 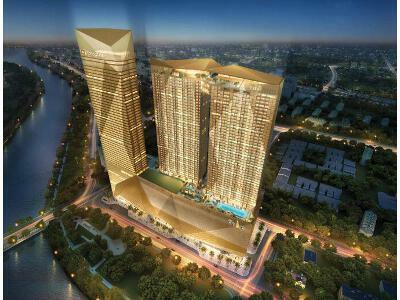 Tallest freehold mixed development with world's luxury hotel the Shangri-La located and shopping mall at Phnom Penh, Cambodia. A rare chance to our a prestigious condo unit with a world renowned branded luxury hotel at the same address with low capital outlay.